This peak is #58 on the Height List for Alberta . This peak is #28 in Prominence List for Alberta .In the White Goat wilderness above Cataract Creek, just east of the southernmost tip of Jasper NP. Name Notes: George Alexander Stewart (1830-1917) surveyed the boundaries of the future Banff NP, with his son, Louis Beaufort Stewart. George was later the first superintendent of the park. 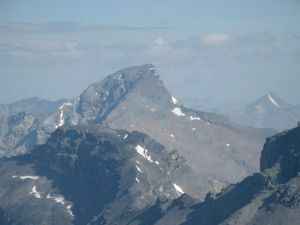 Boles et al implies that this mountain is named after the father, and Mount Louis named after the son, while other sources state that both were named after the son. The mountain may also have been named after Professor L. B. Stewart who accompanied A.P. Coleman in 1893 on his travels through this area, and drew the first maps of the area.